Your bedroom colour is the reflection of your choice and personality. Adding blue to your bedroom energizes you at the end of a long day. 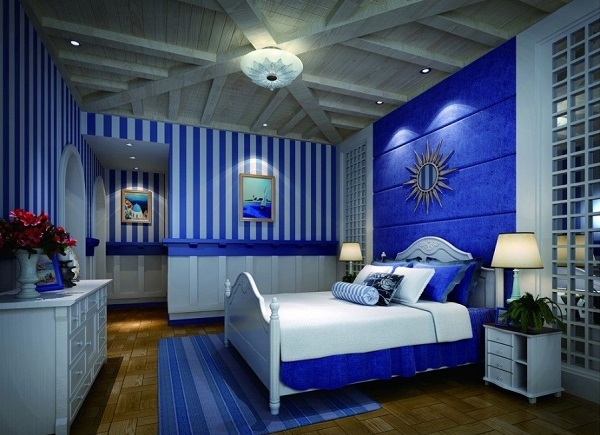 You can never go wrong with blue, so go ahead and create your dream bedroom. Blue is a timeless shade. Traditionally walls were painted a light eggshell or sky blue and windows and furniture were trimmed blue. The ceiling could be either white or blue. Other traditional design ideas with blue are still a favourite theme with many designers. “Blue is a very versatile colour and can create a whole range of effects in your personal space. Paler shades can be soothing and relaxing. Light blue greens work very well with lighter wooden tones. Stronger shades like turquoise, navy and cobalt make a strong style statement. Mix with complementing colors from the colour wheel to create a panorama of colours”, says Pooja Bagri of Bagri Interiors. White is the traditional choice of complementary colour. Darker blue hues like Navy and Cobalt can be accents in the linen and rugs. You can mix in pale shades of cream, yellow and green to create a cosy and harmonious ambience. These are colors perfectly suited to country living. Blue can be a very contemporary choice as well. Earthy tones like brown, brick red, burnt orange as well as neutral tones like cream and beige work sensationally with blue. These shades add a certain sophistication to the bedroom. These combinations add freshness to the colour scape without being very dense. They impart elegance without curbing the natural lightness innate to blue. A very modern look is the result. A hot pink couch will add gaiety to an otherwise staid blue themed room. There are no rules. 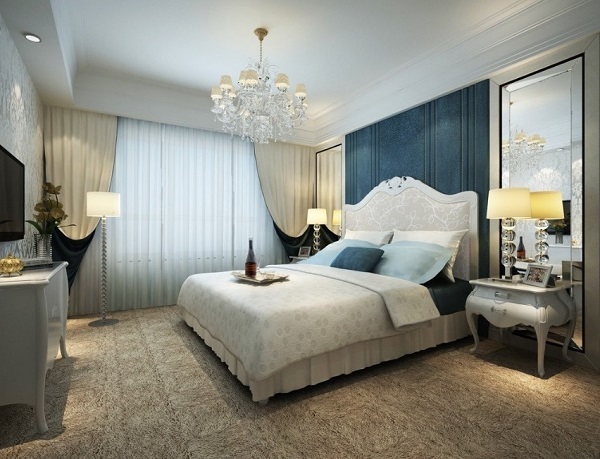 The idea is to mix and match the colors , predominantly shades of blue to create your own space. Experiment with the colour. It is easy to repaint”. smiles Zaman of Mark Interiors. The trick is to balance. Do not go overboard with darker shades, as the bedroom is an area of relaxation and a serene atmosphere is of prime importance. You can add pops of eclectic shades of blue in an otherwise quiet room to create focal points. A vividly patterned rug, a large vase in a bright blue, turquoise lamp shades all add a vibrancy to your bedroom. Commit fully to a bedroom color theme and enjoy! 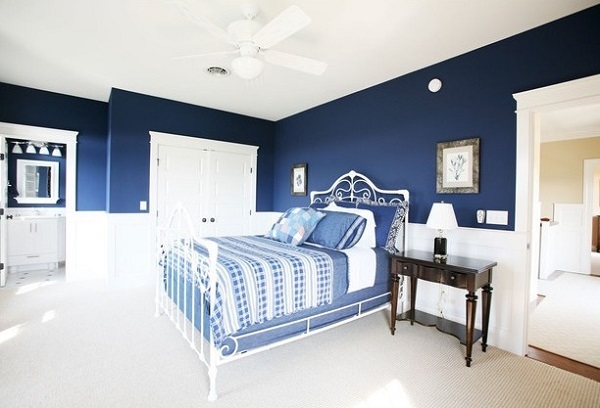 What are your thoughts on decorating a blue bedroom? Share your views in comment area. 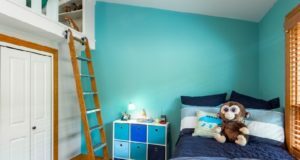 I love the blue and white… it is how I did my son’s room. In fact, each time we moved, I painted his room the same way so he would feel more at home… to help make the transition from moving from one place to another easier on him. 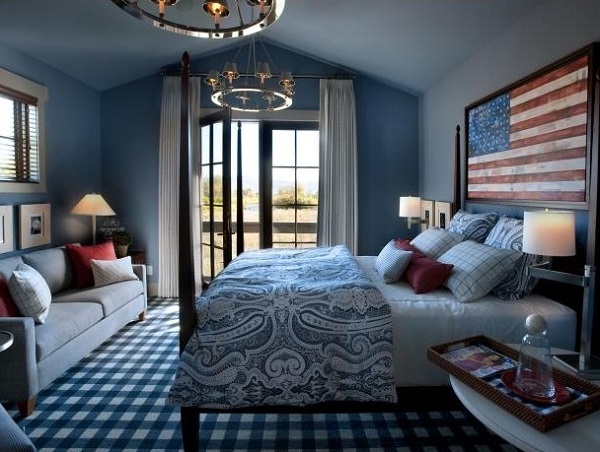 Nice bedrooms in the pics here!